This book is delightful. That’s not a word I usually use. It’s sort of an old-fashioned word that’s not really my style. A word old ladies might use to describe a chickadee singing on a sunny day or a glass of spiced tea in the winter. But it’s the word that comes to mind. Pie is simply a delight to read. 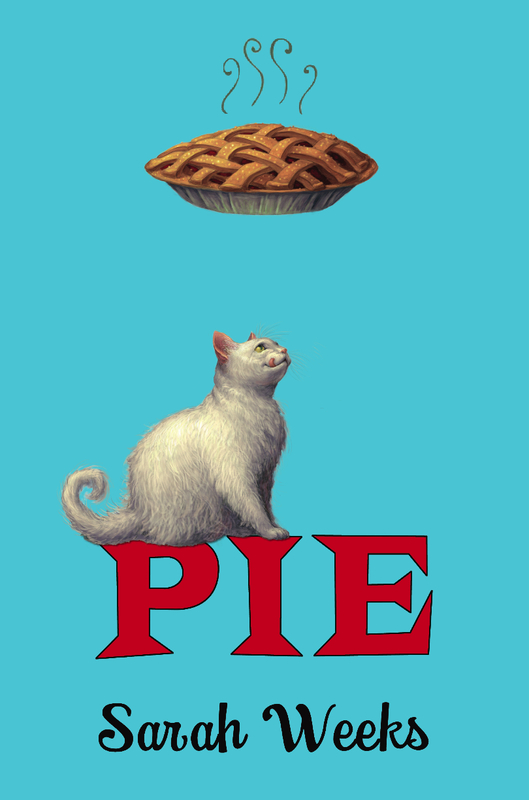 Eleven-year-old Alice lives in Ipswitch, Pennsylvania, and her Aunt Polly Portman is its pie queen. Polly never asks for payment, she simply takes pride and pleasure in pleasing others with her pie-making accomplishments. Notice the alliteration? All the perfectly placed sounds? Yeah, many passages have purposeful placement such as this. They roll along with a melodic mix of consonants, carefully metered and particularly planned. It’s pleasing to read. But not everything is perfect in Ipswitch. Aunt Polly dies suddenly, leaving Alice distraught and confused. For Aunt Polly left her pie crust recipe to her cat, and she left the cat to Alice. How do you leave a recipe with a cat? That’s what the whole town–the whole world, it seems–wants to know. Because Polly Portman’s pie crust is the most coveted pastry in the national pie-making community. And now a professional pilferer has come looking to pinch it. I loved this book. It’s a light read and perfectly pleasing for my seven-year-old to whom I read it out loud. It takes place in the 1940’s and 50’s, so some contextual phrases or events needed a bit of explaining for an audience so young, but the plot and the mystery were easy to follow. There’s a good deal of laughter and silliness. The emotion Alice deals with at her aunt’s loss and her mother’s rejection, however, is real. It’s understandable. So is the easy friendship that develops between Alice and her schoolmate, Charlie. This is a fun read-aloud, a fun together book with a sweet adventure bonus. You see, every chapter begins with a new pie recipe. What a perfect opportunity to move from the couch to the kitchen for a little pie-making adventure of your own. My son and I chose to make the chocolate cream pie and boy was it good! I’d strongly encourage parents and teachers to take full advantage of Pie. It’s simply delightful! Did you make a “PIE”? 😉 We made Chocolate Cream “PIE” ;)I liked this book too! That’s the one my boys chose too! We were at my mom’s cottage when we read this (and when we made the pie) and my mom made me run off copies of FOUR of the pie recipes for her! Wonder if she tried any of them yet. In the wacky world of children’s lit., this sounds like a big hit! Thanks for the review, I’ll have to keep this one in mind to tell my fellow teachers. Hi Michael, thanks for swinging by! Yes, this one is a lot of fun. Funny! Do you like it? Yes, yes! I loved this book. (And also blogged about it for MMGM!) Great choice for middle grade readers. I saw it on your site, and a few others. Had to give it a try, and glad I did!